Never mind the idea of a 100-year storm — Hurricane Harvey, which dumped more than 50 inches of rain on Houston, has been called a 1,000-year storm. In its wake, at least 60 people lost their lives and more than a million others were uprooted, as some 200,000 homes and as many as 500,000 cars were damaged or destroyed. The total bill for all this economic devastation could be as high as $180 billion. Just one week later, Hurricane Irma hit Florida and left about 65% of that state without power. As of this writing, Irma was estimated to have caused another $20-40 billion in damages to those in its path. In the coming months, businesses in the affected areas will struggle to recover, but this will be a more difficult process for some than for others. As an investor, I know that even the best business plan can fail to account for every potential negative occurrence. A seemingly one-time natural disaster, like Harvey or Irma, makes that point all too clearly, but companies can also be affected by other unforeseen disasters that have nothing to do with weather. And those companies that have relied too much on leverage and stretched their borrowing to the limit will find it difficult to get back on their feet. We saw this scenario unfold previously after Hurricane Katrina and Superstorm Sandy, and after other events like the BP oil spill in the Gulf of Mexico and the 9/11 terrorist attacks. The companies that are best prepared to manage through situations like this simply have better balance sheets, by which I mean they borrowed much less money and so they have flexibility to literally weather a storm. Unforeseen catastrophes of this magnitude can cause ripple effects — plants are forced to shut down, shipping and delivery schedules are thrown into chaos, raw materials are unavailable, customers are lost to relocation — all of which adds up to lower revenue and reduced cash flow for affected companies. Any scenario like that could spell disaster for a firm that is over-leveraged and doesn’t have the flexibility to manage and deal with dramatic or unexpected change. If the company’s balance sheet is out of whack due to excessive leverage -- and it’s well-known that lots of companies over-borrowed during the last 10 years -- it could be positioned for potential distress. If the distressed situation lasts too long, because the company can’t attract additional financing or the insurance recoveries from the disaster take longer than expected, then the company may wind up in bankruptcy court trying to negotiate with creditors. But as if to prove the old adage that one man’s ceiling is another man’s floor, when companies have failed to prepare for rising waters, the patient investor with an appetite for distressed debt can sometimes identify significant new opportunity. There are numerous examples in recent years of companies experiencing a disaster which led to a bankruptcy that created an undervalued company with upside potential for future investors. We saw one such case with Energy Partners, Ltd. after the August and September hurricanes in 2008. Those disasters caused third-party production pipelines to shut down, and thereby caused Energy Partners to lose significant production revenues. Ultimately, Energy Partners was forced into bankruptcy in May of 2009 and emerged from corporate reorganization after eliminating about $540 million in liabilities subject to compromise. Years later, this company was acquired by another firm, Energy XXI, but in the meantime, it created interesting opportunities for post-distress equity investors. A similar crisis occurred for many other overleveraged oil and gas companies operating in the Gulf of Mexico after the BP oil spill, when the U.S. government issued a deepwater drilling moratorium. The takeaway for investors should be that disaster can take many forms. It doesn’t have to be weather-related or an act of terrorism, it could be even be something more mundane, like a drastic change in commodity prices or a shift in governmental regulation. And the lesson from this is that the companies that are best prepared to deal with these kinds of changes in their industry, whether they’re acts of God or any other type of disruptive change, are those with cleaner balance sheets and less debt. That’s one of the reasons why I encourage investors not to just blindly throw money at companies in an ETF, but rather to spend some time analyzing the balance sheets of the companies they’re considering for investment. Think about whether a company is well-positioned for the long term and whether it is ready to handle unforeseen event like the ones we’ve seen in Texas and Florida. Even if the next crisis isn’t a super-storm, simple analysis can help you pick long-term winners and losers while the proverbial seas are calm. This article was written by George Schultze from Forbes and was legally licensed through the NewsCred publisher network. Please direct all licensing questions to legal@newscred.com. 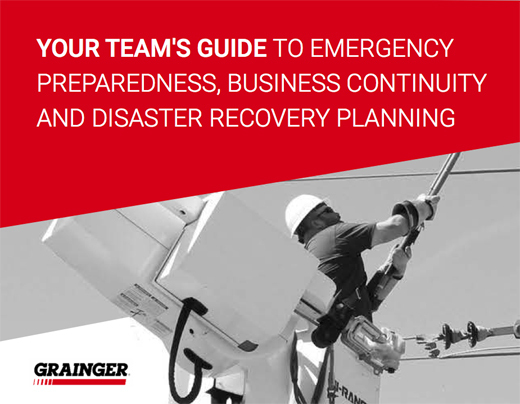 Get the tools you need to help you prepare for a potential disaster, and information that your team can utilize to help you plan for any hazards your organization may face.